A video documentary that could change everything you thought you knew about planetary history. 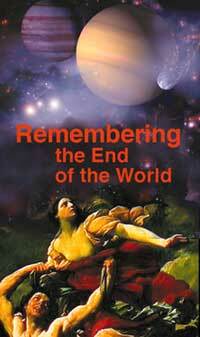 Based on more than two decades of systematic research and cross-cultural comparison by comparative mythologist David Talbott, Remembering the End of the World reconstructs a cosmic drama when planets hung in the sky close to the earth--an epoch of celestial wonder giving way to overwhelming terror. Comparative mythologist David Talbott has devoted much of his life to identifying the "archetypes" or common mythic themes of cultures around the world. His research has been the primary catalyst behind the "Saturn theory." Founder and publisher of the ten-issue Pensee magazine series "Immanuel Velikovsky Reconsidered," he is the author of The Saturn Myth (Doubleday, 1980) and the founder of AEON: A Journal of Myth and Science. He is the director of Thunderbolts.info and co-author (with Wallace Thornhill) of Thunderbolts of the Gods and The Electric Universe.